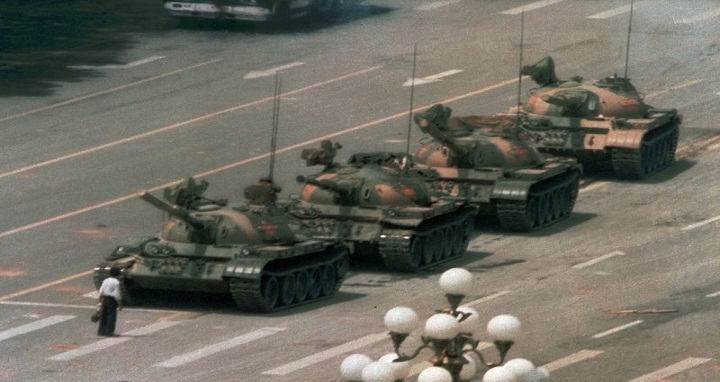 A Chinese man stands alone to block a line of tanks heading east on Beijing's Cangan Boulevard in Tiananmen Square on June 5, 1989. China faced unprecedented criticism of its brutal repression of unarmed citizens demanding more freedoms. More recently, China has begun promoting its model of "socialism with Chinese characteristics" as the preferred path for advancing human rights. Ted Piccone: When it comes to the contentious arena of international human rights, China has arrived. For decades, China's Communist Party largely kept clear of muscling its way onto the global human rights stage, preferring to bide its time while it contended with massive economic and social challenges at home. This began to change in the wake of the Tiananmen Square protests of 1989, when China faced unprecedented criticism of its brutal repression of unarmed citizens demanding more freedoms. Beijing fought hard to defend its one-party system and joined hands with like-minded autocratic states to block external criticism of its hard-line rule. But it engaged in the international human rights system in other ways, including by ratifying a number of relevant treaties and inviting United Nations experts to visit the country and advise officials on compliance with international norms. More recently, however, especially since the ascension of President Xi Jinping, China is moving beyond playing defense and adopting a more self-confident posture in the halls of the United Nations. It has begun promoting its model of "socialism with Chinese characteristics" as the preferred path for advancing human rights while chipping away at well-entrenched principles that define the international human rights system. These include external monitoring by independent experts of a state's human rights record, active participation of civil society as both stewards and sirens for rights, and, when merited, public condemnation of egregious rights violators. Through soft terms like "win-win cooperation" and building a "community of common destiny" — newly blessed as "Xi Jinping thought" deserving of constitutional standing — China is winning some important battles that will determine the meaning of sovereignty and human rights in the 21st century. Given China's accelerating rise in global affairs, this development should not come as a surprise. China's impressive economic growth rates have helped dramatically reduce poverty for millions of Chinese citizens. This progress, in their view, supports the argument that their controlled approach to state-led development guarantees modest but important economic and social rights to its people and, therefore, should be emulated by others. The catch, of course, is the high cost of China's system to equally important political, civil, cultural and minority rights, which China dismisses as inconvenient and disruptive to its one-party control of society. For those on the front lines of defending such rights in China, the penalties are severe — denial of state benefits, detention, torture and death. Mass internment of Muslims in indoctrination camps in the Xinjiang province and militarized police patrols are on the rise. More broadly, China's advances in the fields of Internet censorship and artificial intelligence already are having dire consequences for even a modicum of personal liberties and civil rights enshrined in international human rights law. The Chinese state's growing power is felt not only at home. Its expanding portfolio of loans, direct investment and trade agreements around the world, and its willingness to use them as leverage for diplomatic gains that challenge the U.S.-led international order, are changing the geopolitical game across a wide swath of issues. On the human rights front, China's more confident behavior feels like a direct existential threat because it seeks to undermine the fundamental norms that have shaped global progress toward greater respect for liberal democracy and the rule of law. It is making tangible headway, for example, in Europe, where Hungary and Greece blocked consensus last year on a European Union statement criticizing China's crackdown on lawyers and journalists. It is making steady progress on isolating democratic Taiwan by offering economic incentives to developing countries like El Salvador, Dominican Republic and Burkina Faso. It is partnering with Russia to cut budgetary resources for human rights monitors integral to U.N. peacekeeping missions. In the pre-Trump world, the United States was on the forefront of challenging China's long game on human rights. It regularly called out China's repressive human rights record and built cross-regional coalitions of other democratic states to defend and strengthen the international human rights system. Now, however, the United States has walked away from the U.N.'s primary forum for promoting human rights. The U.S. claims that the body's membership, which regularly includes China, Russia, Cuba and Venezuela, renders it hopelessly ineffective. The reality is quite different. Time and again, the U.N.'s human rights system has responded to egregious violations by calling emergency sessions and dispatching independent experts and investigators to document abuses, demand accountability and defend human rights activists in such places as Iran, Syria, North Korea, Eritrea, Myanmar and Cambodia. The United States, as in many other domains of international affairs, is now missing in action. The result is clear: China and its allies are filling the vacuum and, over time, will neuter, if not fundamentally redefine, the core precepts of universal human rights. Ted Piccone (@piccone_ted) is senior fellow, foreign policy at the Brookings Institution.